Venue & Accommodation: Aonang Villa Resort, Krabi, Thailand. 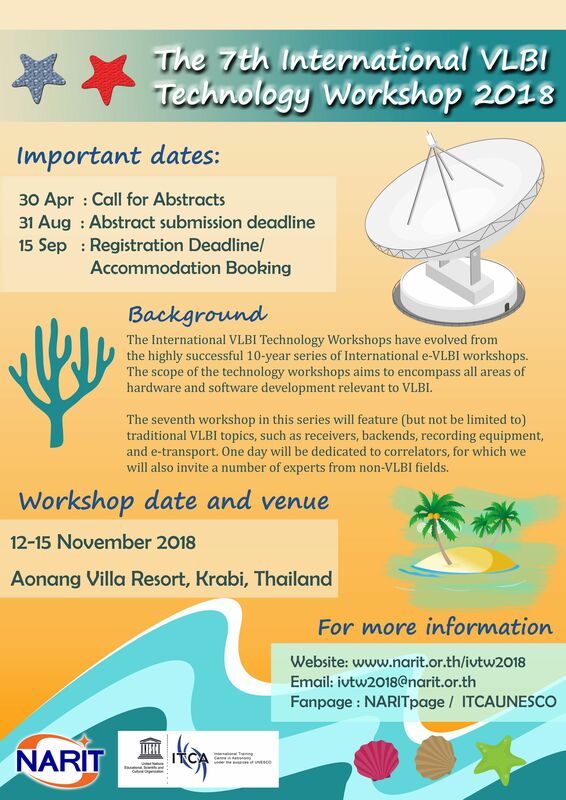 The Seventh International VLBI Technology Workshop will be hosted by NARIT, the National Astronomical Research Institute of Thailand, and take place from November 12 to 15, 2018, at Aonang Villa Resort, Krabi, Thailand. NARIT is in the process of establishing the Thai Radio Astronomy Observatory (TNRO) in Chiang Mai, which will host a new 40-m Radio Telescope and a 13.2-m VGOS station on the same site, expected to see first light in early 2020. The International VLBI Technology Workshops have evolved from the highly successful 10-year series of International e-VLBI workshops. The scope of the technology workshops aims to encompass all areas of hardware and software development relevant to VLBI.